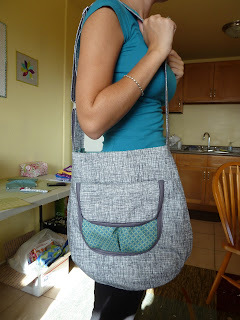 I had purchased the Sidekick Tote pattern from Anna a while back and decided to give it a try last week. I made the larger version, measuring 15" x 14"
I used Timeless Treasure sketchpad for the outside and Hope Valley for the lining, with a little Notting Hill thrown in. Some new things I learned with this bag was how to install a recessed zipper and making handles using this hardware. It came together so quickly and easily, i've already started the smaller one for a Christmas present! Oh I love it! It looks like such a practical design - and your fabric choices are great. Gorgeous! Very nice Jennifer. I love the recessed zipper and the Notting Hill pocket! This bag has tempted me after seeing several at SS! Yours looks great, Jennifer! Looks great - I love the plaid for the inside pocket. I actually just bought this pattern yesterday so I'm excited to try it as well.